Cathaoirleach of Castlebar Municipal District, Cllr Michael Kilcoyne, Cathaoirleach of Mayo County Council Cllr Al Mc Donnell with other councillors, council staff, Turlough Park staff and village residents and pupils from Park National School at the raising of the Green Flag. 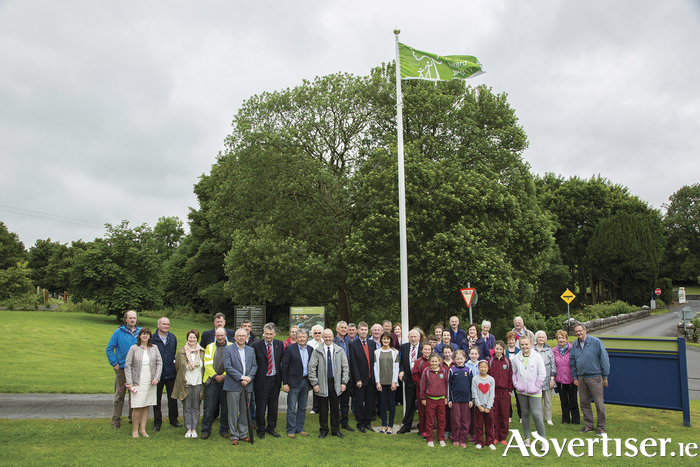 In early 2016 An Taisce sought nominations from local authorities throughout the 32 counties of Ireland to submit application for Parks and Open spaces to be considered for a prestigious award known as the Green Flag. The Green Flag Award scheme recognises and rewards well managed parks and green spaces, setting a benchmark standard for the management of these recreational outdoor spaces around the world. Judging took place in June 2016 with Turlough Park House and Gardens achieving Green Flag Status in late 2016. The judges complimented the Mayo County Council team specifically noting the hard work and dedication by Noreen Hennigan Horticulturist who is responsible for the Park and noted the strong working relationship between Mayo County Council and the OPW and the local community. The project team for Mayo County Council were Noreen Hennigan (Horticulturist ) Mayo County Councill, Padraic Kelly (Executive Architect ) Mayo County Council, Peter Gill (Parks Superintendent ) Mayo County Council and Geeta Keena (Senior Architect ) Mayo County Council.